It was dusk one evening when my boyfriend and I found ourselves driving a quiet B road in search of our evening hideout. We’d spent the last couple of nights wild camping and were well in need of a shower, cooked dinner, and a real bed to sleep in. “It's here somewhere” I said, following the blue dot on Google Maps until we’d passed the place that my phone thought was our destination. “We must have missed it…” I said, as we drove a little further looking for a spot to turn the car around, as we did spotting a black sign and a gravel driveway marked curi for something called ‘Kudhva’. We headed up the empty driveway, past an abandoned blue Ford truck, to a parking area where we loaded our bags and headed up an eerie path signposted “adventurous route to Kudhva”. There was a real quiet, wildness about where we were. In all honesty, I didn’t really know where we were… and that fact was irresistible to me. At the top of the path, we were greeted by two goats roaming the yard, and a large shed with a big, old table balancing on two hay bales. A barefoot young man with a Hawaiian shirt and lazy drawl showed us to our home for the night, and we both stopped outside it admiring its architectural distinctness and unique allure. 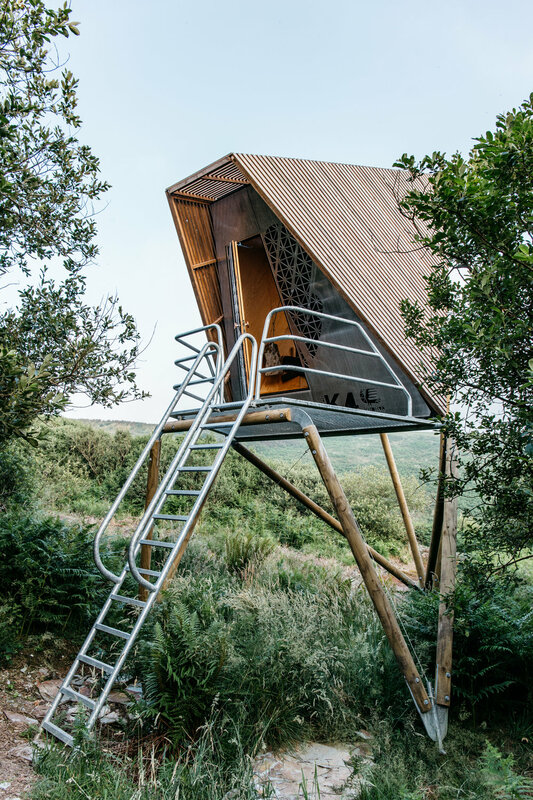 Nestled amidst the trees, a geometric cabin on stilts stood boldly before us. A pale blue sky provided a natural backdrop to the cabin, and the door had been left open, inviting us to see what was inside. ‘Kudhva’ means hideout in Cornish, and that is exactly what this unique accommodation tucked somewhere in Northern Cornwall is. Established just a couple of years ago, Kudhva is set in a 45 acre abandoned quarry overlooking the sea, where four unique architectural cabins and a number of tentsiles (tents suspended between trees, a few feet off the ground) have been set up for visitors to stay. This is a place where nature rules, and man is invited to live alongside it; enjoy a digital detox in a space where phone signal is sparse and entertainment comes in the form of beautiful views and immersion in wilderness. There are a couple of accommodation options at Kudhva; choose either one of four Kudhvas or a tree tent. We went for the namesake of the accommodation, the Kudhva. These ‘architectural hideouts’ are uniquely shaped huts on stilts; with a large balcony, sofa/lounge area with a large window looking out at the surrounding landscape, and a mezzanine bed. I spied the sofa area as the perfect place to read a book and drink my morning tea, while the bed provided just the right amount of space with bright windows looking onto treetops and sunsets. While the shelter provided is just the right amount of minimal, there are also showers, bathrooms and a central kitchen and lounge area with a real cosy and rustic feel - all based in the reception building, less than 3 minutes walk from each Kudhva. The kitchen provides all crockery and amenities you might need; a fridge, food storage, pans and plates etc. A large wooden table balances on hay bales, with fern leaves decorated in jam jars and fresh lemon water ready to be enjoyed. There is also firewood available for £8 a bundle, so you can retreat to your Kudhva after dinner and enjoy the warm embers with a cup of hot chocolate (or something stronger) before bed. On a piece of land that was once considered too wild to be tamed, Kudhva is nestled amidst oak trees and ferns, on a 45 acre disused quarry that overlooks the sea. We spent the morning wandering the grounds, following mysterious paths that we didn’t know where would lead. From forest to grasslands, slate piles to ocean views, and then we found a small oasis where cliffs surround a small lake and a waterfall drips water down a mossy, rocky wall. Wandering the grounds at Kudhva is essential for really understanding the property and environment on which you are staying. Beyond the grounds, within 10 minutes you can be in Trebarwith Strand; a tiny seaside village dominated by a large, sandy beach. Although, we never managed to see the beach as high tide meant water came right up to the village. Instead, we rambled on sea cliffs overlooking the ocean and found secret wild swimming spots to cool off in. Trebarwith features a lovely pub called the Port William where a gin and tonic and sunset views can be enjoyed, as well as a little cafe serving hot drinks, cakes and lunches. It’s possible to surf and SUP at Trebarwith at low tide, or head up onto the cliffs and enjoy the marvellous, Cornish views; turquoise water, wild flower and the beauty of gull rock on the horizon. Recent additions to Kudhva are the events and activities held at the grounds. Saturday morning yoga sessions will take place throughout June and July, while the popular Sunday Services sees locally sourced food, speakers, music and conversation fill the air every Sunday. There are also upcoming Wood Fire Sunday Lunch events taking place, with more information on the Instagram and website. The idea of Kudhva is to create a hub of activities that allow you to be creative, inquisitive and thoughtful while being immersed in nature; to connect with likeminded individuals while connecting with your natural surroundings at the same time. Being only in its second year since establishment, Kudhva is ever-evolving and developing. New and exciting plans appear to be on the horizon, and we can’t wait to see what happens with Kudhva in the future. This is definitely one to watch, so follow them on Instagram to keep informed. 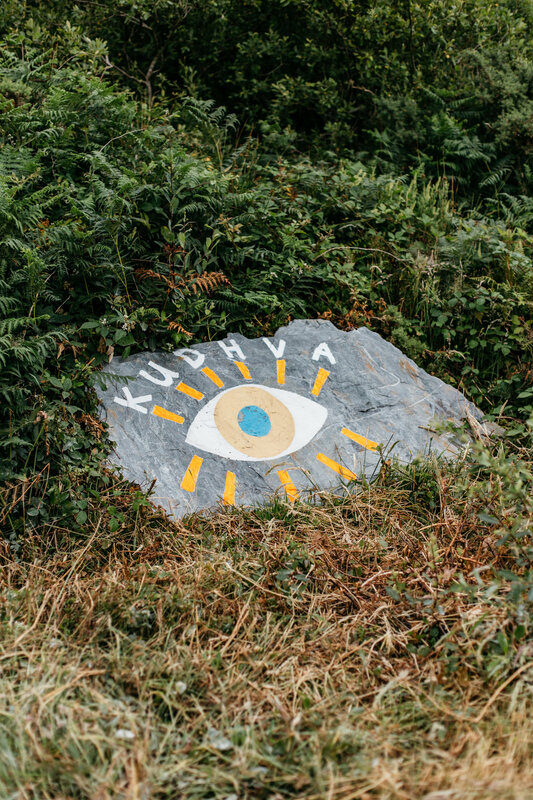 In a modern age where disconnecting is become evermore difficult, Kudhva provide the perfect retreat into nature; a true wilderness nestled within a Cornish valley. We hope you enjoy your own hide out at Kudhva this summer. Choose from either a tree tent or one of four Kudhvas, with a two night minimum stay. Kudhvas sleep two people are are priced at £122 per night.